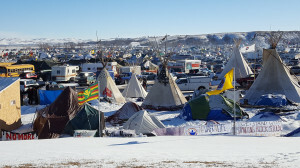 Cannon Ball, North Dakota (Oceti Sakowin or Council of the Seven Fires Camp) – Today, the people won a major victory in the fight to stop the Dakota Access Pipeline (DAPL). 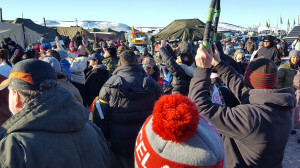 The US Army Corps of Engineers sided with the Water Protectors and refused the final permit that would have allowed Energy Transfer Partners to drill under Lake Oahe. There will be battles ahead but this was another amazing people-powered victory. When people unite, we have power. This time people power defeated big oil and big finance. View of the camp from Media Hill. When we arrived at the Oceti Sakowin Camp this morning, we were impressed by its size and organization. From our view on the highway, the camp stretched far into the distance and was packed with all kinds of structures. While we sat in a long line of cars waiting to enter, friendly volunteers were stationed along the road to manage traffic, make sure that we weren’t bringing any banned items into camp and orient us. News trucks were stationed on the closed portion of the highway just north of the camp entrance. Today is the last day before the Corps of Engineers’ eviction notice is supposed to go into effect and thousands of people were converging at the camp. Some long time camp residents said that the camp population had doubled this weekend. We estimate that at least 1,000 cars and buses came to the camp today. 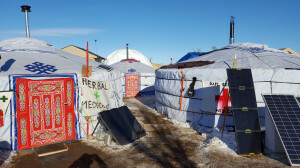 Two of the Yurts at the MedicHealer Council. The camp looked full and we were concerned that finding a parking space would be difficult. We called Popular Resistance reporter, Crystal Zevon and she met us at the entrance gate to show us around. The main street is lined with flags. We followed it to the MedicHealer area and found a spot not too far away. We had a large bag of donations to deliver. The MedicHealer area consisted of a series of yurts with colorful doors and storage tents and sheds. The daily noon orientation was cancelled due to the overwhelming influx of new people. Margaret set to work helping to organize new donations and Kevin set out to deliver non-medical donations and find the legal tent. We saw many familiar faces, people we have worked with on a variety of issues — climate justice, stopping extreme energy, stopping wars, racism and more. People hear the news of the Corps of Engineers decision at the Sacred Circle. 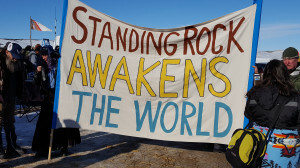 The courage and ethics of the participants at Standing Rock, some of whom have been there since April, were like a magnet to those of us who care about justice and the future of the planet. 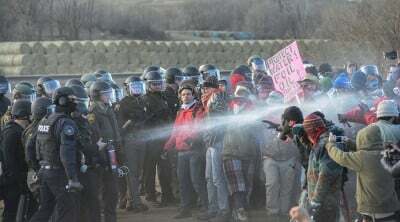 When the militarized police and corporate mercenaries used extreme, violent tactics, we and many others felt we had no choice but to be there — to stand with the Water Protectors at this critical moment when the Corps of Engineers was threatening to evict them and the Governor claimed there was an emergency and people had to be removed. Tens of thousands showed up in solidarity at this ceremonial, prayer camp that stood for Indigenous rights and the people and planet over corporate profit. Wood stoves unpacked and ready to go. In the afternoon, the news went around that the Army Corps of Engineers denied the permit for the final phase of the pipeline. At first it was hard to believe and we were skeptical. People around us asked — who said that, what is the source? Then we heard the announcement at the Sacred Circle and we were convinced. People whooped and hollered, pumped fists in the air, beat drums and danced in celebration. There are many lessons from #NoDAPL that can be applied to stop other pipelines and on other issues. No doubt having 20,000+ people there the day before the Corps of Engineers said there was going to be an eviction sent a powerful message that the people would not obey. Walking through the camp today we saw people digging in for the winter. They were building long-term structures out of wood and straw bail, cutting firewood, building their health, legal and media centers, and food services — showing they were not leaving. 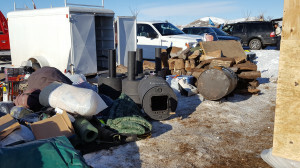 They were installing military tents with wood stoves, indeed wood stoves could be seen in many parts of the camp ready for installation. Solar panels were also evident in various parts of the camp, ensuring a long-term energy supply. Youth snow sliding down Media Hill. #NoDAPL placed the government in a lose-lose situation. There were so many people there that it would have been very difficult to clear the camp. It was reported today that there will not be efforts by any of the agencies from local to state to federal to evacuate the camp. And if the government had tried to clear the camp against the people’s will, then that would have increased support for the Water Protectors. 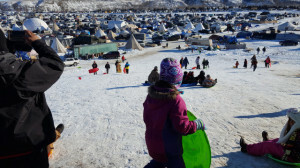 If they leave the camp alone, it will prevent further construction of the pipeline. This is a classic example of how nonviolent campaigns work, put the government/corporations in a situation where they have no winning alternative except to grant the movement’s demands. We recognize this is an important victory, but not a final one. On their Facebook page the Standing Rock Sioux are also clear. They write that there are still many questions to be answered . Here are ten issues they have initially raised, no doubt more information will be coming from them soon. Will the Army Corps actually conduct an Environmental Impact Statement? If so, on what portion of the project – just the river crossing, or the whole pipeline? Which alternative routes will be considered? Will a “no-build” option also be considered? How long will the EIS take? What input will the tribe have? What will the public participation process look like? In what way(s) was the original Environmental Assessment prepared by the Army Corps deemed inadequate? What was the result of the tribal consultation process exploring possible changes to the regulatory process for pipelines in general? have any changes been proposed? How easily will these decisions be reversed by a Trump administration? How will these decisions be affected by the outcomes of DAPL’s lawsuit against the Army Corps, scheduled to be heard on Friday? Is the US government prepared to use force to stop the company from drilling under the river without a permit, if necessary? Last week people united stopped ratification of the TPP against transnational corporate power. Now, this is a tremendous victory over the oil industry as well as their big financiers. Watch out, people may soon realize we have power when we join together and mobilize. We head back to the Oceti Sakowin camp tomorrow. We look forward to finding out what the next steps will be in this campaign.